Now that the claims of racism against USDA official Shirley Sherrod have been thoroughly debunked and it has been proven that Andrew Breitbart has yet again defamed someone's good name to advance his right-wing agenda, I thought there was something interesting going on with the story - the conservative media have moved to defend the propagandist, claiming that he was the one who was tricked, not the countless people who believed his lies. On the July 21, 2010 Hannity, Sean Hanity made note that the video was indeed taken out of context, but was quick to attack the Department of Agriculture and the White House for acting "prematurely," despite coming out two days earlier saying that the video was "[j]ust the latest in a series of racial incidents," and stating that "So it's interesting that it took the new media to expose this." The whole key to this story is that Andrew Breitbart was set up. He was sent a tape as we now know was massively out of context. It didn't look like this woman was saying something racist when she first said oh, it was taken out of context. Breitbart’s argument is simple and straightforward: Regardless of what else is in Sherrod’s speech, the first video released on BigGovernment.com features Sherrod telling a tale of racism that is received by the NAACP audience with laughter and cheers. They weren’t cheering redemption; they were cheering discrimination. Upon hearing the cheers, Sherrod fails to offer any immediate clarification and even smiles right along with them. 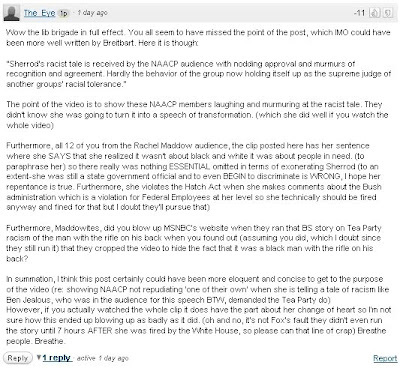 Breitbart’s main objective by releasing the video was to call out the NAACP, an organization who has recently gone to great lengths to condemn the Tea Party’s alleged racism, for sanctioning racism in it’s own organization. Sherrod immediately became the scapegoat for the embarrassed NAACP and USDA, but she was never the target, the NAACP itself was, and the delight the audience took in the racist part of Sherrod’s speech leaves them exposed. Seems to me that Breitbart's own site made Sherrod the target, taking credit for the whole thing. Mike Flynn also wrote for Breitbart's site attacking Politico for pointing out that Big Government featured an edited video, claiming that they did not edit the video - they simply put it out there. He also rewrites history asking if it was Big Government's intention to prove Sherrod a racist, would they have "have neglected to mention that she eventually did the right thing?" I believe they did neglect to mention Sherrod did the right thing. Breitbart stated in the original "exposé" that "context is everything," yet he only posted the two truncated clips. The man who created Big Journalism obviously didn't think the journalistic thing to do was to investigate the entire story, and he only posted one correction regarding his post: "While Ms. Sherrod made the remarks captured in the first video featured in this post while she held a federally appointed position, the story she tells refers to actions she took before she held that federal position." So, if that is how Breitbart is going to play, and he is going to try and cower away from his story and try and shift focus, lets follow him on his journey and use his logic to illustrate a point. 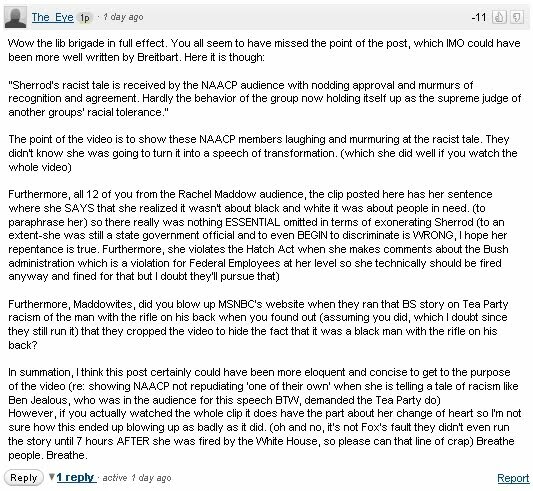 If the NAACP is guilty of awarding racism because those in attendance of Sherrod's speech didn't flee the room in horror, then I wonder what the fan's of Breitbart have to say to this now debunked story? Now what about the folks at Big Journalism - did they investigate this matter any further? Big Journalism's articles mirrored the sentiments of the other Big sites, defending Breitbart and placing blame on others like the mainstream media or the NAACP. Big surprise - this is the same exact thing that was posted on Big Government by the Big Government Editorial Panel (mentioned above). Big Propagandist Guy Benson had gone on to defend Breitbart in a lengthy post, but the most entertaining portion came when he asked whether anyone would "really believe that Andrew Breitbart would intentionally distort a video clip to make a one-day splash" and "his growing reputation with a deliberate, easily refutable distortion?" A majority of the comments in this thread focus mostly on attacking those who made rush judgments (even though that was what Breitbart did in his first post) - the Breitbart followers even go as far as to attack conservatives who felt duped, calling them trolls and insulting their intelligence. It also appears that in order to try and control the news story, the right-wing media is trying to bring up the whole JournoList non-troversy - a smear that they have full control over. This author questions this whole right-wing created conspiracy and finds the criticisms of JournoList to accurately define Breitbart's consortium of right-wing bloggers and anonymous sources with his Big sites. Anyway, the point being made here is that Breitbart accused an organization of promoting racism because of a speech taken out of context and the reactions of it's audience. This post simply points out the reactions of Breitbart's audience once the subject is placed in context. As proven by the comments above, Breitbart and his followers are a bunch of racists. It was simply hilarious. Good ol' Andrew can not take the heat so his hatchlings take the negative comments out of the kitchen. There were numerous times posts were removed which were critical of the slanderer in chief. His little lemmings will follow him blindly. I hope Ms. Sherrod sues him in California with its punitive damages. Exhibit One-Doctored Acorn tapes. Exhibit Two. Misleading Sherrod tapes. First question: Mr. Breitbart, who sent you the partial tape of Ms. Sherrod? That will be a whole lot of fun to hear this answer because the next question will be, what steps did you take to determine its authenticity and obtain the full tape before you made it public. Closing argument to the jury. Airing doctored tapes, same song, different verse, a little bit louder, a little bit worse. Breitbart all to often gets a free pass and the media, Democrats, whoever, need to put Breitbart's feet to the fire and not let up. He is already trying to redirect the story and absolve himself of any wrongdoing, and that must not be allowed!